Cineplex shows us their first steps in becoming a coalition type programs and Best Western's next systemwide promo is here. Back in September when we released our Top 5 Travel Rewards Currencies we told you that one program to watch out for was Cineplex's Scene program. We told you this because it was set to grow beyond earning points primarily at movies and via Scotiabank. 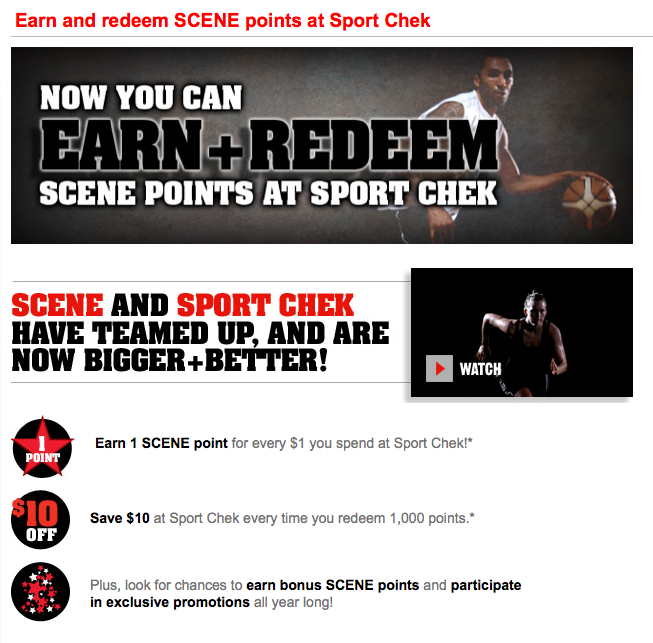 Now we know of one of the first forays of Scene building into a coalition type program as they have added Sport Chek to their roster for points earning and redemption. Sport Chek used to be an Air Miles partner not too long ago and it looks like they may have missed being part of the loyalty world so it is nice to see them join up with Scene. You'll earn 1 scene point for every $1 spent at Sport Chek and be able redeem 1,000 points for a $10 savings which is your typical 1% return if you don't include any bonuses. Find out more here. It looks like Toronto will once again have direct service to Russia after losing Aeroflot. Transaero, another large Russian carrier will begin 1x weekly service between Toronto and Moscow on December 19th. Transaero has their own frequent flyer program called Privilege and they are not part of any airline alliance (their FFP actually has no airline partners) (Source Airlineroute.net). If you purchase $500 or more of Air Canada gift cards by December 1st you receive a promo code for 10% off a future Air Canada flight. The 10% promotional code is valid for flight bookings made by December 9, 2014, for travel between January 10, 2015 and June 17, 2015. So if you know you'll be booking Air Canada flights by the 9th for travel during the period they allow just buy yourself some gift cards to pay for that flight and use the code to save 10%. Find out more here. Costco.ca is offering 3x Aeroplan Miles on all purchases made from today to December 1st. Find out more here.